Are you tired of the rising cost of things around you? Would you like to be able to handle all the situations that confront you, no matter what the cost? No problem! You have an excellent mind, but you need to make optimal use of it. Let our exercises help you make 100% use of your brain in an easy step by step process so you will always have the money you need when you need it! Use our manual for 30 days and if you are not satisfied, then simply return the manual and we will refund your purchase price. It's that simple! ...... Happiness and Success In Life starts with your state of mind. As odd as it may sound to some people, our outer world of circumstances shapes itself through our inner world of thought. YOU actually hold the key to your own happiness by exercising your power to choose your own thoughts and feelings. If you maintain a favorable state of mind, you will get favorable results in life. If you carry an unfavorable state of mind, you will get comparable results in life. Through total brain stimulation, you automatically develop a fantastic state of mind, because your brain is fulfilling the function it was designed to fulfill. You become better in all areas of your life, you feel satisfied and you easily tap into the abundance around you. You were designed to be healthy. You were designed to be creative. You were designed to be happy - and all because you have such a large, wonderful brain that can be easily used to better yourself and the conditions around you. ...... When you look at an animal in its environment, it is fulfilling its natural function and it correspondingly has everything it needs. If an animal is born with 4 legs, IS IT natural for him to use only 3 of those legs all his life, instead of 4? Would the animal be happier if it used only 3 of its legs, instead of 4? Naturally, whatever physical qualities a creature is born with, it is meant to use those qualities completely in order to fulfill its natural function in life. Mankind is no different, and man's brain is no different. Whatever kind of brain a person is born with, each person is meant to use it completely, not partially. When you do so, happiness and success in any avenue of your life is assured. ...... What can you do, say, think or feel that does not involve the brain in some way? Aren't we all here on the planet to help each other improve, progress and develop ourselves? 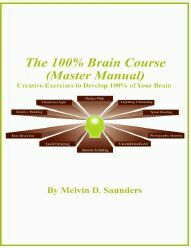 Our 100% Brain Course manual guides you through this developmental process with its 223 mental and emotional exercises. Wild mammals use all of their brain tissue, because evolution has created each species with exactly the gray matter it needs to survive and function correctly. Human beings also have all the brain tissue they need to survive with comfort, health and prosperity. The more gray matter used, the better you can achieve these aims in life. It took a lot of practice to get to wherever you are right now in your life, and to get anywhere else will also take practice, so wouldn't it be wise to do the things that will create the best possible life for yourself? If the details of just living in the world are beginning to overwhelm you, our course manual will guide you through the necessary steps to get better results! .......You can make the most money you can with your skills! 7) To develop flexibility and adaptability in your life, do something different every day. Shop at a different store. Take a different route home. Bake a pie or a loaf of bread. Involve yourself in a new game or sport, like roller skating, bowling, karate or sky diving. Introduce yourself to a new neighbor. Sameness every day is a death knell to your brain. For more complete usage of your brain, diverse stimulation is the key. It also gets you unstuck from habits and ruts that are bringing you unfavorable results.